Boxwood Means | Has the Recession Really Hit Small-Cap Properties Harder than Trophies? Has the Recession Really Hit Small-Cap Properties Harder than Trophies? Have larger, high-quality so-called "trophy" real estate assets actually out-performed their small-cap counterparts around the country, as certain information sources have suggested of late? The most meaningful answer requires some qualifications - but for the most part is: "No." As some experts have recently testified before congressional bodies, there's evidence that domestic and offshore institutional investors anticipating continued economic recovery have tended in recent months to bid up market prices for big, impeccably located properties in major markets. However, other reviews of comparative price performance demonstrate that commercial properties valued at $5 million and under have, on the average, proven far less volatile than institutional-grade real estate. And that conclusion remains valid despite the recent recovery spike in trophy-class values that as yet has eluded small-cap properties. Perhaps predictably, various CRE industry reports have perpetuated the 40 percent figure: i.e., that U.S. commercial properties collectively suffered a 40 percent decline in value between their 2007 peak and 2010 trough. But much of this analysis ignores the small-cap space, which requires specialized analytical tools to effectively assess. Proprietary analysis by Boxwood Means in fact indicates that not only have values of smaller structures retained far greater stability than trophy-type real estate throughout the cycle - it also busts the myth that primary metro areas boast greater price stability than secondary and tertiary markets during downturns. Boxwood's Small-Cap Price Index (SCPI)-100, which covers the $5 million-and-under space in 102 markets across the country, calculates an average peak-to-trough value decline of barely 20 percent. That's hardly half the overall decline of 42 percent cited in the Moody's/REAL CPPI index. Meanwhile Boxwood's SCPI-20 index indicates small-cap values in 20 of the largest metro areas fell an average of 27 percent - far more than the 16 percent posted collectively for the 80-some smaller markets. Boxwood's findings are to be highlighted in an article scheduled to be published in an upcoming issue of Mortgage Banking Magazine. 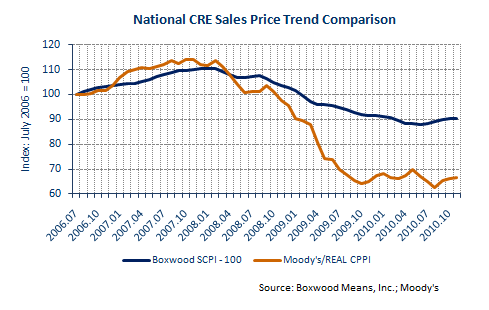 Lest we come off as biased toward Boxwood Means data, we'll point out here that another national commercial real estate pricing index, based on a "repeat sales" methodology, indicates that values of non-trophy income properties appreciated at a stronger pace than their top-tier counterparts as the bubble expanded - but declined less after it burst. This index shows a roughly 33 percent peak-to-trough decline for non-trophy real estate during the Great Recession, compared to about 38 percent for investment-grade. There are also indications that values of top-tier real estate peaked at least several months before smaller properties - and that three years later investors started bidding more aggressively on trophy properties before the momentum began to spill over to non-institutional properties. And perhaps that's something that helps perpetuate the perception that smaller properties have been harder-hit. Testifying recently before Congressional Oversight Panel for the Troubled Asset Relief Program, the chair of the CRE Finance Council's research committee noted that trophy properties on the average have pretty quickly seen values recover 17 percent in recent months after tumbling 39 percent peak-to-trough. But he said the CRE market as a whole - and especially the small-cap space - remains effectively "unchanged" since overall values fell 44 percent from their peak. He likewise cited a widening "bifurcation" in the availability of financing for trophy assets compared to smaller properties. However he also acknowledged, in contrast to lenders financing trophy assets, that at least some regional and community banks continued lending against small-cap and non-trophy properties throughout the credit crisis. We'll also point out here that Boxwood's research tends to support the historical reality that the more-homogeneous universe of institutional properties tends to be more cyclically sensitive than the more-heterogeneous world of small-cap properties. The CPPI covers the four major income-property "food groups" in major metros - a group that tends to see institutional capital come and go in relatively dramatic fashion as economic conditions turn. In contrast the SCPI measures comprise primary and secondary property types - including owner-occupied facilities that face less exposure than income-producing properties to cyclical ups and downs, and hence tend to boast more stable valuations. Obviously the dubious premise that small-cap CRE prices sank further than investment-grade assets doesn't help prospects for recovery of commercial banks, which hold the lion's share of small-balance commercial loans. A more-realistic analysis of the trophy-vs.-small-cap contrast suggests that in many metro areas, the equity-finance gap may well be less pronounced than is assumed. Hence rather than being tempted to hold out for better times through "extend and pretend" strategies, the community banking sector might thrive once again by sticking with prudent risk-management policies: updating evaluations and appraisals; making loan-by-loan assessments; and, in many cases, making conservative loan-loss recognition decisions.